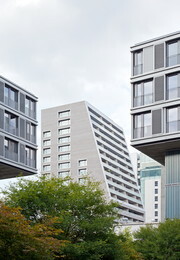 In spring of 2014, a high-rise building with 51 high-quality apartments was erected in Zurich on the outskirts of a former industrial zone. Blending it all in with the historic architecture of Escher-Wyss attests of amazing competence. The interior of the high-rise building alternates between exposed concrete walls and white plastered surfaces. In addition to the large windows, the light oak parquet flooring in the Farina shade ensures a light and friendly home.